August 15, 1767, 11:25:40 AM LMT, Ajaccio, Corsica. (Source: Dr. Richard Garnett, Curator of Books, British Museum) Died of cancer in exile at Longwood, St. Helena, May 5, 1821. Napoleon was one of the most powerful individuals which humanity has ever produced. Many think of him as the reincarnation of Alexander the Great, and certainly his rays (a first ray soul and fourth ray personality) were, arguably, the same as those of Alexander. 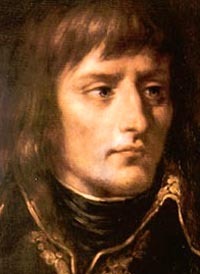 Whatever may have been his good intentions and real accomplishments, Napoleon is remembered as the embodiment of imperial egotism (he crowned himself emperor) and ambition for grandeur—traits found also in Mussolini (on a much lower level) and all-too-possible for a Leo subject upon the first ray. His Scorpio Ascendant made him relentless, and unbelievably formidable in war. It was said, in his time, that Napoleon on the field was worth 40,000 men. We must not picture him as Gros painted him in 1796—standard in one hand, drawn sword in the other, costume ornate with colored sash and official insignia, long chestnut hair wild in the wind, eyes, brow, and lips fixed in determination; this seems too ideal to be true. Two years younger than his twenty seven year old hero, Gros is said to have seen him planting that standard on the bridge at Arcole,' but the painting is probably the product of ardent idolatry—the man of art worshiping the men of deeds. And yet, two years later, Gubrin portrayed Napoleon with essentially the same features: hair falling over forehead and shoulders, brows arched over eyes somber and resolute, nose going straight to the point like his will, lips closed tight as of a mind made up. This too is but one aspect of the man—the martial; there were many other moods that could relax those lineaments, as in his playful pulling of his secretary's ears, or in his paternal ecstasy over the infant "King of Rome." By 1802 he had discarded those long locks—all but one which dangled over a receding forehead. He put on weight after forty years, and sometimes used his paunch to support his hand. Frequently, especially when walking, he clasped his hands behind his back; this became so habitual that it almost always betrayed him at a masquerade. Throughout his life his hands attracted attention by the perfection of their skin and the tapering fingers; indeed, he was quite proud of all four of his extremities. However, Las Cases, who thought him a god, could not help smiling at those "ridiculously handsome hands." The Emperor's complexion was sallow, brightened, however, by facial muscles quickly reflecting—if he wished—each turn of feeling or idea. Napoleon's head was large for his stature, but was well shaped; his shoulders were broad, his chest well developed, suggesting a strong constitution. He dressed simply, leaving finery to his marshals; his complex hat, spreading like a folded waffle, had no adornment but a tricolor cockade. Usually he wore a gray coat over the uniform of a colonel of his guard. He carried a snuffbox on his waistband, and resorted to it occasionally. He preferred knee breeches and silk stockings to pantaloons. He never wore jewelry, but his shoes were lined with silk and bound with buckles of gold. In dress, as in his final political philosophy, he belonged to the Ancien Régime. He was "scrupulously neat in his person. He had a passion for warm baths, sometimes lingering in them for two hours; probably he found in them some relief from nervous tensions, muscular pains, and an itching skin disease that he had contracted at Toulon. [Virgo Mars conj. Neptune–1769] He used eau de cologne on his neck and torso as well as on his face. He was "exceedingly temperate" in food and drink; diluted his wine with water, like the ancient Greeks; [Virgo Mars–1769] and usually gave only ten or fifteen minutes to his lunch. On campaigns he ate as chance allowed, and often hurriedly; sometimes this led to indigestion, and at the most critical moments, as at the battles of Borodino and Leipzig. He suffered from constipation; in 1797 he added hemorrhoids, [Virgo Mars conj. Neptune–1769] which he claimed to have cured with leeches. "I never saw him ill," said Méneval, but he added: "He was only occasionally subject to vomiting bile, which never left any aftereffects.... He had feared, for some time, that he was affected with a disease of the bladder, because the keen air of the mountains caused him a kind of dysuria; but this fear was found to be without foundation." However, there is considerable evidence that in his later life Napoleon was afflicted with inflammation of the urinary tract, sometimes leading to painful and inconveniently frequent urination. His overstrung nerves sometimes (as at Mainz in i8o6) collapsed into convulsions [Virgo Mars conj. Neptune–1769] partly resembling epileptic seizures; but it is now generally agreed that he was not subject to epilepsy. There is no such agreement about the imperial stomach. "In all my life," he told Las Cases on September i 6, 1816, "I never had either a headache or a pain in my stomach." Me'neval corroborated him: "I have never heard him complain of pain in the stomach."" However, Bourrienne reported having more than once seen Napoleon suffering such stomach pains that "I would then accompany him to his bedchamber, and have often been obliged to support him." In Warsaw, in 1806, after violent stomach pains, he predicted that he would die of the same disease as his father—i.e., cancer of the stomach."' The doctors who performed an autopsy on him in 1821 agreed that he had a diseased—apparently a cancerous—stomach. Some students would add gonorrhea and syphilis to his woes, and suggest that some by products remained with him to the end." He refused to treat his ailments with medicine. As a general accustomed to wounded soldiers, he admitted the need of surgery; but as for drugs, he dis trusted their side effects, and preferred, when ill, to fast, drink barley water, lemonade, or water containing orange leaves, to take vigorous exercise to promote perspiration, and let the body heal itself. "Up to 1816," Las Cases reported, "the Emperor did not recollect having ever taken medicine"; but the imperial memory was then susceptible to wishful forgetting. "Doctor," he explained to the physician of the S.S. Northumberland on the way to St. Helena, "our body is a machine for the purpose of life; it is organized to that end that is its nature. Leave the life there at its ease; let it take care of itself; it will do better than if you paralyze it by loading it with medicines. He never tired of teasing his favorite physician, Corvisart, about the useless ness of medicine; finally he led him to agree that, all in all, drugs had done [Virgo Mars conj. Neptune–1769; this passage alone is almost enough to demand the 1769 chart, for the 1768 chart has no Virgo. And Neptune mixed with Virgo always gives a hyper-sensitivity to drugs and a powerful disinclination to take them. And the lack of Virgo and Neptune energies almost always make attitudes such as expressed in the sentences above non-existent.] He amused his final physician, Francesco Antommarchi, by asking him which of the two groups, the generals or the doctors, would, at the Last Judgment, be found responsible for the greater number of deaths. Despite his ailments, he had in him a fund of energy that never failed till Moscow burned. An appointment to service under him was no bureaucratic sinecure, but almost a sentence to slow death; many a proud official crept away exhausted after five or six years of keeping the Emperor's pace. One of his appointees complimented himself on not being stationed in Paris: there "I should die of application before the end of the month. He has already killed Portalis, Crétet, and almost Treilhard, who was tough; he could no longer urinate, nor the others either."" 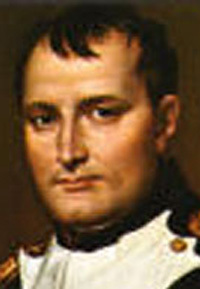 Napoleon admitted the high mortality among his aides. "The lucky man," he said, "is he who hides away from me in the depths of some province. When he asked Louis Philippe de Ségur what people would say of him after his death, and Se'gur repl ied that they would express universal regret, Napoleon corrected him: "Not at all; they will say ‘Ouf!'" in profound and universal relief. We might have supposed that these full and exciting days would be paid for by sleepless nights, but Bourrienne assures us that the Emperor slept well enough—seven hours at night, and "a short nap in the afternoon . He boasted to Las Cases that he could go to sleep at will, "at any hour, and in any place," whenever he needed repose. He explained that he kept his many different affairs arranged in his head or memory as in a closet with several drawers; "When I wish to turn from a business, I close the drawer that contains it, and I open that which contains another.... If I wish to sleep I shut up all the drawers, and I am soon asleep." Goethe thought that Napoleon's mind was the greatest that the world had ever produced." Lord Acton concurred. Méneval, awed by the nearness of power and fame, ascribed to his master "the highest intellect which has ever been granted to a human being." Taine, the most brilliant and indefatigable opponent of Napoleolatry, marveled at the Emperor's capacity for long and intense mental labor; "never has a brain so disciplined and under such control been seen." Let us agree that Napoleon's was among the most perceptive, penetrating, retentive, logical minds ever seen in one who was predominantly a man of action. [This matches neither the Leo Mercury or Sagittarius Mercury chart, for Mercury falls in both these signs; but it is classis Ray 5]. He liked to sign himself as a "member of the Institute," and he once expressed to Laplace his regret that "force of circumstances had led him so far from the career of a scientist"[Ray 5], at that moment he might have ranked the man who adds to human understanding above the man who adds to man's power [Ray 5]. However, he could be forgiven for scorning the "ideologues" of the Institute, who mistook ideas for realities, [this is the dead opposite of Mercury in Sagittarius, for whom ideas, ideals, beliefs, and ideologies always trump facts, logic, and “realities.”] explained the universe, and proposed to tell him how to govern France. His mind had the defects of a romantic imagination [Mercury in Leo 1769], but it had the realistic stimulus of daily contact with the flesh and blood of life. His persistent mental activity was part and servant of persistent action at the highest level of statesmanship. First of all, he was sensitive. He suffered from the keenness of his senses: his ears multiplied sounds, his nose multiplied odors, [again, Virgo (Mars-Nept) accounts for this as little else could] his eyes penetrated surfaces and appearances and discarded the incidental to clarify the significant. He was curious and asked thousands of questions, read hundreds of books, studied maps and histories, visited factories and farms [Ray 5]; Las Cases was amazed at the range of his interest, the scope of his knowledge about countries and centuries [Ray 5]. "His first rule in case of unforeseen emergencies was to attend to them immediately, at whatever time of the day or night. He left permanent instructions with Bourrienne: "Do not wake me when you have good news to communicate; with such there is no hurry. But when you brinly bad news rouse me instantly, for then there is not a moment to lose!" [In addition to Capricorn, this is also a Virgo attitude: Virgo is the problem-solver, and its method is to scan a project or situation, quickly note what is working right and leave it, and concentrate on what needs fixing.]" Despite all forethought and foresight he made (to our hindsight) an ample variety of mistakes in judging men and in calculating results. [All of what follows seems like Sun/Mercury in Leo] He might have known that Josephine could not bear a month of chastity, and that Marie Louis could not tie Austria to peace. He thought he had charmed [Leo] Alexander at Tilsit and Erfurt, while the Czar, with Talleyrand's coaching, was deceiving him elegantly. It was a mistake to intensify British hostility in 1807 by so boldly [Leo] extending his power over Piedmont, Lombardy, and Switzerland; a mistake to put his brothers on thrones too big for their brains; a mistake to suppose that the German states in the Confeder ation of the Rhine would submit to French sovereignty [Leo] when a chance came to break.away; a mistake to publish a document that showed him thinking of conquering [Leo] Turkey; a mistake (as he later confessed) to waste the Grand Army in Spain; a mistake to invade endless Russia, or remain there as winter neared. Supreme over so many men, he was subject, as he said, to the "nature of things," to the surprises of events, the frailties of disease, the inadequacies of his power. "I have conceived many plans," he said, "but I was never free to execute one of them. For all that I held the rudder, and with a strong hand, the waves were a good deal stronger. I was never in truth my own master; I was always governed by circumstance." And by imagination. His soul was a battleground between keen observation enlightening reason and vivid imaginings clouding it with romance, [Leo] even with superstition; now land then he dallied with omens and horoscopes [Now this sounds more like Sagittarius]. When he went to Egypt he took with him many books of science and many of sentiment or fancy—Rousseau's La Nouvelle He'loise, Goethe's We rther, Macpherson's "Ossian"; he confessed later that he had read Wer ther seven times; and in the end he concluded that "imagination rules the world."" Stranded in Egypt, he fed on dreams of winning India [Leo]; struggling through Syria, he pictured himself conquering Constantinople with his handful of men [Leo], and then marching upon Vienna like a more invincible Suleiman [Leo]. As power drove caution out of his blood he ignored Goethe's warning of Entsagen—the acknowledgment of bounds; his proliferating successes challenged the gods [Leo]—violated the calculus of limitations; and in the end he found himself petulant and helpless, chained to a rock in the sea. His pride had begun with the self centeredness natural to all organisms. In his youth it swelled defensively in the clash of individuals and families in Corsica, and then against the class and racial arrogance of students at Brienne. It was not by any means pure selfishness; it allowed devotion and generosity to his mother, to Josephine and her children; love for the "King of Rome"; and an impatient affection for his brothers and sisters, who also had selves to pamper and preserve. But as his successes widened, his power and responsibilities, his pride and self absorption, grew. He tended to take nearly all the credit for his armies' victories, but he praised, loved, and mourned Desaix and Lannes. Finally he identified his country with himself, and his ego swelled with her frontiers. His pride, or the consciousness of ability, sometimes descended to vanity, or the display of accomplishments. "Well, Bourrienne, you too will be immortal Why, General?" "Are you not my secretary?" "Tell me the name of Alexander's." "Hm, that is not bad, Bourrienne." He wrote to Viceroy Eugéne (April I 4, i8o6): "My Italian people must know me well enough not to forget that there is more in my little finger than in all their brains put together."" The letter N, blazoned in a thousand places, was occasionally graced with a J for Josephine. The Emperor felt that showmanship was a necessary prop of rule. "Power is my mistress," he declared to Roederer in 1804, when Joseph was angling to be declared heir; "I have worked too hard at her conquest to allow anyone to take her away from me, or even to covet her.... Two weeks ago I would not have dreamed of treating him unjustly. Now I am unforgiving. I shall smile at him with my lips but he has slept with my mistress." "' (Here he did himself injustice; he was a jealous lover, but he was a forgiving man.) "I love power as a musician loves his violin. So his ambition leaped from bound to bound: he dreamt of rivaling Charlemagne and uniting Western Europe, forcibly including the Papal States; then of follow ing Constantine from France through Milan to the capture of Constanti nople, building classic arches to commemorate his victories; then he found Europe too little, a mere "molehill,"'Ill and proposed to rival Alexander by conquering India. It would be hard work, for himself and a million troops, but it would be repaid in glory, for him and them; and if death overtook them on the way it would not be too great a price to pay. "Death is nothing; but to live defeated and inglorious is to die daily." "I live only for pos terity La gloire became his ruling passion, so hypnotic that for a decade nearly all France accepted it as its guiding star. He pursued his aims with a will that never bent except to leap until he had exhausted the sublime and became pitiful. His unresting ambition gave unity to his will, direction and substance to every day. At Brienne, "even when I had nothing [assigned? ] to do, I always felt that I had no time to lose.""' And to Jérôme in 1905: "What I am I owe to strength of will, to character, application, and audacity. Daring was part of his strategy; time and again he surprised his enemies by quick and decisive action at un expected places and times. "My aim is to go straight toward my objective, without being stopped by any consideration"; it took him a decade to learn the old adage that in politics a straight line is the longest distance between two points. Sometimes his judgment and conduct were clouded and perverted with passion. His temper was as short as his stature, and it shortened as his power spread. He had the heat and wilds of Corsica in his blood; and though he usually managed to check his wrath, those around him, from Josephine to his powerful bodyguard Roustam, watched their every word and move lest they incur his wrath. He became impatient with contradiction, tardiness, incompetence, or stupidity. When he lost his temper he would publicly berate an ambassador, swear at a bishop, kick philosopher Volney in the stomach, or, faute de mieux, boot a log on the hearth. And yet his anger cooled almost as soon as it flared; often it was put on, as a move in the chess of politics; in most cases he made amends a day or a minute afterward. He was seldom brutal, often kind, playful, good humored,"' but his sense of humor had been weakened by hardship and battle; he had little time for the pleasantries of leisure, the gossip of the court, or the wit of the salons. He was a man in a hurry, with a pack of enemies around him, and an empire on his hands; and it is difficult for a man in a hurry to be civilized. His infidelities caused Josephine many hours of worry and grief; he explained to her (if we may believe Mine. de Re'rnusat) that these divertinie,nti were natural, necessary, and customary, and should be over looked by an understanding wife; she wept, he comforted her, she forgave him.51 Otherwise he was as good a husband as his cares and wanderings would allow. When Marie Louise came to him he accepted monogamy (so far as we know) with new grace, if only because adultery might lose him Austria. His devotion to her was doubled when he beheld her agony in giving him a son. He had always shown a fondness for children; his law code gave them especial protection; now the infant King of Rome became the idol and bearer of his hopfs, carefully trained to inherit and wisely rule a France giving laws to a united Europe. So the great ego enlarged itself with marital and parental love. I had expected to find him brusque and of uncertain temper, instead. of which I found him patient, indulgent, easy to please, by no means exacting, merry with a merriness which was often noisy and mocking, and sometimes of a charming bonhomie.... I was no longer afraid of him. I was maintained in this state of mind by all that I saw of his pleasant and affectionate ways with Josephine, the assiduous devotion of his officers, the kindliness of his relations with the consuls and the ministers, and his familiarity with the soldiers. of the general efficiency of his rule. He saw thousands of men dead on the field of battle, and went on to other battles; yet we hear of his often stop ping to comfort or relieve a wounded soldier. Véry Constant "saw him weep while eating his breakfast after coming from the bedside of Marshal Lannes," mortally wounded at Essling in 1809. There is no question about his generosity, nor about his readiness to forgive. He repeatedly and once too often forgave Bernadotte and Bourrienne. When Carnot and Chénier, after years of opposition to Napoleon, appealed to him to relieve their poverty, he sent help immediately. At St. Helena he contrived excuses for those who had deserted him in 1813 or 1815. Persons brought up to the elegant manners of the Old Regime could not bear the blunt directness of Napoleon's style of movement and address. He amused such people by the aw ward consciousness of his carriage and the occasional coarseness of his speech. He did not know how to put others at their ease, and did not seem to care; he was too eager for the substance to fret about the form. "I do not like that vague and leveling phrase les con venances [the proprieties].... It is a device of fools to raise themselves to the level of people of intellect. . . . 'Good taste' is another of those classical expressions which mean nothing to me.... What is called 'style,' good or bad, does not affect me. I care only for the force of the thought. Secretly, however, he admired the easy grace and quiet considerateness of the gentle man; he longed to win approval from the aristocrats who made fun of him in the salons of Faubourg St. Germain. In his own way he could be "fasci nating when he chose to be." His low opinion of women may have been due to his hurried carelessness of their sensitivity. So he remarked to Mme.. Charpentier, "How ill you look in that red dress! and he turned Mme. de Staël to enmity by rank ing women according to their fertility. Some women rebuked his rudeness with feminine subtlety. When he exclaimed to Mme. de Chevreuse, "Dear me, how red your hair is!" she answered, "Perhaps it is, Sire, but this is the first time a man has ever told me so." When he told a famous beauty, "Madame, I do not like it when women mix in politics," she retorted, "You are right, General; but in a country where they have their heads cut off, it is natural that they should want to know why. Nevertheless Me'neval, who saw him almost daily, noted "that winning charm which was so irresistible in Napoleon." He liked to talk sometimes garrulously, almost always usefully and to the point. He invited scientists, artists, actors, writers, to his table, and sur prised them by his affability, his knowledge of their field, and the aptness of his remarks. Isabey the miniaturist, Monge the mathematician, Fontaine the architect, and Talma the actor left reminiscences of these meetings, all testifying to the "grace, amiability, and gaiety" of Napoleon's conversa tion. He much preferred talking to writing. His ideas atvanced faster than his speeches; when he tried to write them down he wrote so rapidly that no one not he himself could then decipher his scrawl. So he dictated, and as 41,000 of his letters have been published, and doubtless other thousands were written, we can begin to understand how the honor of being his secretary was a sentence to hard labor. Bourrienne, who took the post in 1797, had the good fortune to be dismissed in 1802, and so survived till 1834. He was ex pected to join Napoleon at 7 A.M., work all day, and be.on call at night. He could speak and write several languages, knew international law, and, with his own method of shorthand, could usually write as fast as Napoleon dictated. Méneval, who succeeded Bourrienne in 1802, labored still harder, for "I did not know any'kind of shorthand " Napoleon was fond of him, often jested with him, but wore him out al'most daily, after which he would tell him to go and take a bath. At St. Helena the Emperor recalled: "I nearly killed poor Méneval; I was obliged to relieve him for a while from the duties of his situation, and place him, for the recovery of his health, near the per son of Marie Louise, where his post was a mere sinecure. In i8o6 Napo leon authorized him to engage an assistant, François Fain, who served to the end, and on all campaigns. Even so M'eneval was quite worn out when he escaped from his fond despot in 1813. It was one of those love affairs that thrive on inequality recognized and not abused. A revolution can be neither made nor stopped. The only thing that can be done is for one of several of its children to give it a direction by dint of victories. A revolution is an idea which has found its bayonets. Courage is like love; it must have hope to nourish it. Every soldier carries a marshall's baton in his pack. Few things are brought to a sucessful issue by impetuous desire, but most by calm and prudent forethought. From the heights of these pyramids, forty centuries look down on us. If I always appear prepared, it is because before entering an undertaking, I have meditated long and have foreseen what might occur. It is not genius where reveals to me suddenly and secretly what I should do in circumstances unexpected by others; it is thought and preparation. If you start to take Vienna - take Vienna. Let France have good mothers, and she will have good sons. Let the path be open to talent. Medicines are only fit for old people. Music of all the arts has the most influence on the passions and the legislator should give it the greatest encouragement. The French complain of everything, and always. The people to fear are not those who disagree with you, but those who disagree with you and are too cowardly to let you know. The torment of precautions often exceeds the dangers to be avoided. It is sometimes better to abandon one's self to destiny. There are only two forces that unite men - fear and interest. Vanity made the [French] Revolution; liberty was only a pretext. Water, air, and cleanness are the chief articles in my pharmacy. We must laugh at man to avoid crying for him. When I want any, good head work done; I always choose a man, if possible with a long nose. When small men attempt great enterprises, they always end by reducing them to the level of their mediocrity. You must not fear death, my lads; defy him, and you drive him into the enemy's ranks. One of the greatest military commanders and a risk taking gambler; a workaholic genius and an impatient short term planner; a vicious cynic who forgave his closest betrayers; a misogynist who could enthrall men; was all of these and more, the twice-emperor of France whose military endeavors and sheer personality dominated Europe in person for a decade, and in thought for a century. Napoleon was born in Ajaccio, Corsica, on August 15th 1769 to Carlo Buonaparte, a lawyer and political opportunist, and his wife, Marie-Letizia Bonaparte. The Buonaparte's were a wealthy family from the Corsican nobility, although when compared to the great aristocracies of France Napoleon's kin were poor and pretentious. 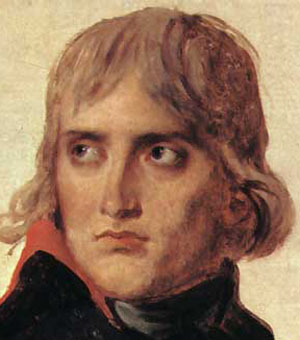 A combination of Carlo's social climbing, Letizia's adultery with the Comte de Marbeuf - Corsica's French military governor - and Napoleon's own ability enabled him to enter the military academy at Brienne in 1779. He moved to the Parisian École Royale Militaire in 1784 and graduated a year later as a second lieutenant in the Artillery. Spurred on by his father's death early in February 1785, the future emperor had completed in one year a course that often took three. Despite being posted on the French mainland, Napoleon was able to spend much of the next eight years in Corsica thanks to his ferocious letter writing and rule bending, as well as the effects of the French revolution and sheer good luck. There he played an active part in political and military matters, initially supporting the Corsican rebel Pasquale Paoli, a former patron of Carlo Buonaparte. Military promotion also followed, but Napoleon became opposed to Paoli and when civil war erupted in 1793 the Buonapartes fled to France, where they adopted the French version of their name: Bonaparte. Historians have frequently used the Corsican affair as a microcosm of Napoleon's career. The French Revolution had decimated the republic's officer class and favoured individuals could achieve swift promotion, but Napoleon's fortunes rose and fell as one set of patrons came and went. 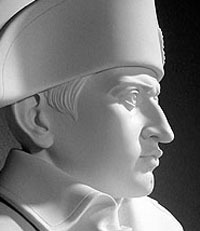 By December 1793 Bonaparte was the hero of Toulon, a General and favourite of Augustin Robespierre; shortly after the wheel of revolution turned and Napoleon was arrested for treason. Tremendous political 'flexibility' saved him and the patronage of Vicomte Paul de Baras, soon to be one of France's three 'Directors', followed. In 1796 France attacked Austria. Napoleon was given command of the Army of Italy - the post he wanted - whereupon he welded a young, starving and disgruntled army into a force which won victory after victory against, theoretically stronger, Austrian opponents. Aside from the Battle of Arcole, where Napoleon was lucky rather than clever, the campaign is legitimately legendary. Napoleon returned to France in 1797 as the nation's brightest star, having fully emerged from the need for a patron. Ever a great self-publicist, he maintained the profile of a political independent, thanks partly to the newspapers he now ran. In May 1798 Napoleon left for a campaign in Egypt and Syria, prompted by his desire for fresh victories, the French need to threaten Britain's empire in India and the Directory's concerns that their famous general might seize power. The Egyptian campaign was a military failure (although it had a great culturally impact) and a change of government in France caused Bonaparte to leave - some might say abandon - his army and return in the August of 1799. Shortly after he took part in the Brumaire coup of November 1799, finishing as a member of the Consulate, France's new ruling triumvirate. The transfer of power might not have been smooth - owing much to luck and apathy - but Napoleon's great political skill was clear; by February 1800 he was established as the First Consul, a practical dictatorship with a constitution wrapped firmly around him. However, France was still at war with her fellows in Europe and Napoleon set out to beat them. He did so within a year, although the key triumph - the Battle of Marengo, fought in June 1800 - was won by the French general Desaix. Having concluded treaties that left Europe at peace Bonaparte began working on France, reforming the economy, legal system - the famous and enduring Code Napoleon - church, military, education and government. He studied and commented on minute details, often while travelling with the army, and the reforms continued for most of his rule. Bonaparte exhibited an undeniable skill as both legislator and statesmen - a study of these achievements could rival those of his campaigns for size and depth - but many have argued that this talent was deeply flawed and even fervent supporters admit that Napoleon made mistakes. The Consul's popularity remained high - helped by his mastery of propoganda, but also genuine national support - and he was elected Consulate for life by the French people in 1802 and Emperor of France in 1804, a title which Bonaparte worked hard to maintain and glorify. Nevertheless, Europe was not at peace for long. Napoleon's fame, ambitions and character were based on conquest, making it almost inevitable that his reorganised Grande Armée would fight further wars. However, other European countries also sought conflict, for not only did they distrust and fear Bonaparte, they also retained their hostility towards revolutionary France. If either side has sought peace, the battles would still have continued. For the next eight years Napoleon dominated Europe, fighting and defeating a range of alliances involving combinations of Austria, Britain, Russia and Prussia. Sometimes his victories were crushing - such as Austerlitz in 1805, often cited as the greatest military victory ever - and on other occasions he was either very lucky, fought almost to a standstill, or both; Wagram stands as an example of the latter. Bonaparte forged new states in Europe, including the German Confederation - built from the ruins of the Holy Roman Empire - and the Duchy of Warsaw, whilst also installing his family and favourites in positions of great power: Murat became King of Naples and Bernadotte King of Sweden, the latter in spite of his frequent treachery and failure. The reforms continued and Bonaparte had an ever-increasing effect on culture and technology, becoming a patron of both the arts and sciences while stimulating creative responses across Europe. Napoleon also made mistakes and suffered setbacks. The French navy was kept firmly in check by their British equivalent and the Emperor's attempt to tame Britain through economics - the Continental System - harmed France and her supposed allies greatly. Bonaparte's interference in Spain caused even larger problems, as the Spanish refused to accept Napoleon's brother Joseph as ruler, instead fighting a vicious guerilla war against the French invaders. The Spanish 'ulcer' highlights another problem of Bonaparte's reign: he couldn't be everywhere within his empire at once, and the forces he sent to pacify Spain failed, as they often did elsewhere. Meanwhile, British forces gained a toehold in Portugal, slowly fighting their way across the peninsula and drawing ever more troops and resources from France itself. Nevertheless, these were Napoleon's glory days, and on March 11th 1810 he married his second wife, Marie-Louise; his only legitimate child - Napoleon II - was born just over a year later, on March 20th 1811. The Napoleonic Empire may have shown signs of decline by 1811, including a downturn in diplomatic fortunes and continuing failure in Spain, but such matters were overshadowed by what happened next. In 1812 Napoleon went to war with Russia, assembling a force of over 400,000 soldiers, accompanied by the same number of followers and support. Such an army was almost impossible to feed or adequately control and the Russians repeatedly retreated, destroying the local resources and separating Bonaparte from his supplies. The Emperor continually dithered, eventually reaching Moscow on September 8th after the Battle of Borodino, a bludgeoning conflict where over 80,000 soldiers died. However, the Russians refused to surrender, instead torching Moscow and forcing Napoleon into a long retreat back to friendly territory. The Grande Armée was assailed by starvation, extremes of weather and terrifying Russian partisans throughout, and by the end of 1812 only 10,000 soldiers were able to fight. Many of the rest had died in horrible conditions, with the camp's followers faring even worse. In the final half of 1812 Napoleon had destroyed most of his army, suffered a humiliating retreat, made an enemy of Russia, obliterated France's stock of horses and shattered his reputation. A coup had been attempted in his absence and his enemies in Europe were re-invigorated, forming a grand alliance intent on removing him. As vast numbers of enemy soldiers advanced across Europe towards France, over-turning the states Bonaparte had created, the Emperor raised, equipped and fielded a new army. This was a remarkable achievement but the combined forces of Russia, Prussia, Austria and others just used a simple plan, retreating from the emperor himself and advancing again when he moved to face the next threat. Throughout 1813 and into 1814 the pressure grew on Napoleon; not only were his enemies grinding his forces down and approaching Paris, but the British had fought out of Spain and into France, the Grande Armée's Marshalls were underperforming and Bonaparte had lost the French public's support. Nevertheless, for the first half of 1814 Napoleon exhibited the military genius of his youth, but it was a war he couldn't win alone. On March 30th, 1814, Paris surrendered to allied forces without a fight and, facing massive betrayal and impossible military odds, Napoleon abdicated as Emperor of France; he was exiled to the Island of Elba. Undoubtedly bored and aware of the continuing discontent in France, Napoleon made a sensational return to power in 1815. Travelling to France in secret, he attracted vast support and reclaimed his Imperial throne, as well as re-organising the army and government. This was anathema to his enemies and after a series of initial engagements Bonaparte was narrowly defeated in one of history's greatest battles: Waterloo. This final adventure had occurred in less than 100 days, closing with Napoleon's second abdication on June 25th 1815, whereupon British forces forced him into further exile. 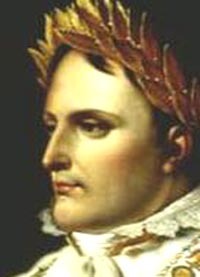 Housed on St. Helena, a small rocky island well away from Europe, Napoleon's health and character fluctuated; he died within six years, on May 5th 1821, aged 51. The causes of his death have been debated ever since, and conspiracy theories involving poison are rife. Simple narratives of Napleon's life can fill whole books, let alone detailed discussions of his achievements, and historians remain divided over the Emperor - was he a cruel tyrant or an enlightened despot? Was he a tortured genius or a blunderer with luck on his side? These discussions are unlikely to be resolved, thanks partly to the weight of source material - making it unlikely that a historian could truly master everything - and Napoleon himself. He is, and remains, so fascinating precisely because he was such a massive blend of contradictions - itself prohibiting conclusions - and because of the massive effect he had on Europe: no one should forget that he helped first perpetuate, then actively create, a state of European wide-warfare that lasted for twenty years. Few individuals have ever had such a huge effect on the world, on economics, politics, technology, culture and society, making Bonaparte's life more fantastic than any believable fiction. Nevertheless, it is possible to attempt a small summary on his character: Napoleon may not have been a general of utter genius, but he was very good; he may not have been the best politician of his age, but he was often superb; he may not have been a perfect legislator, but his contributions were hugely important. Whether you admire him or hate him, the real and undoubted genius of Napoleon, the qualities that have drawn praise such as Promethean, was to combine all these talents, to have somehow - be it luck, talent or force of will - risen from chaos, then built, steered and spectacularly destroyed an empire before doing it all again in a tiny microcosm one year later. Whether hero or tyrant, the reverberations were felt across Europe for a century. This article is about Napoléon Bonaparte. For other meanings, see Napoleon (disambiguation). Napoléon Bonaparte (15 August 1769 — 5 May 1821) was the ruler of France from 1799 until 1815. He was the effective ruler of France (as First Consul) starting in 1799, declared himself Emperor Napoléon on May 18, 1804 and continued as Emperor until April 6, 1814; he is also known as Napoléon I or Napoléon le Grand ("the great"). Napoléon, over the course of little more than a decade, acquired control of most or all of the western and central mainland of Europe by conquest or alliance until his defeat at the Battle of Waterloo, followed shortly by capture and exile. Napoléon appointed many members of the Bonaparte family as monarchs, but generally speaking, they did not survive his downfall. Napoléon was one of the "enlightened monarchs." He was born Napoleone Buonaparte in the city of Ajaccio on Corsica one year after Corsica had been sold to France by the Republic of Genoa. He later adopted the more French-sounding Napoléon Bonaparte, the first known instance of this appears in an official report dated March 28, 1796. His family was of minor Corsican nobility. His father, Carlo Buonaparte, an Italian-born attorney, was named Corsica's representative to the court of Louis XVI in 1778, where he remained for a number of years. Biographers agree that the dominant influence of Napoléon's life was his mother, Laetitia. Ahead of her time, she had her 8 children bathe every other day -- at a time when even those in the upper-classes took a bath perhaps once a month. Carlo arranged for Napoléon's education in France. He entered a military school at Brienne-le-Château, a small town near Troyes, on May 15, 1779. Napoléon considered himself an outsider, not learning French until age 10; accusations of being a foreigner would dog him throughout his life, especially since he spoke French with an Italian accent. Due to Carlo's influence, Napoléon was admitted into the elite École Militaire in Paris, from which he graduated on October 28, 1784, receiving his commission as a 2nd lieutenant of artillery in January 1785, at the age of 16. He then attended the royal artillery school at Auxonne near Dole. When the French Revolution began in 1789, Napoléon returned to Corsica, where a nationalist struggle sought separation from France. Civil war broke out, and Napoléon's family fled to France. Napoléon supported the Revolution and quickly rose through the ranks. In 1793, he freed Toulon from the royalists and from the British troops supporting them. In 1795, when royalists marched against the National Convention in Paris, he had them shot. Nicknamed The Little Corporal after forces under his command forced the Austrian army to retreat at the Battle of Lodi in 1796, Napoléon was a brilliant military strategist, able to absorb the substantial body of military knowledge of his time and to apply it to the real-world circumstances of his era. An artillery officer by training, he used artillery innovatively as a mobile force to support infantry attacks. When appointed commander-in-chief of the ill-equipped French army in Italy, he managed to defeat Austrian forces repeatedly. In these battles, contemporary paintings of his headquarters show that he used the world's first telecommunications system, the Chappe semaphore line, first implemented in 1792. Austrian forces, led by Archduke Charles, had to negotiate an unfavorable treaty; at the same time, Napoléon organized a coup in 1797 which removed several royalists from power in Paris. In 1798, the French government, afraid of Bonaparte's popularity, charged him with the task of invading Egypt to undermine Britain's access to India. An indication of Napoléon's devotion to the principles of the Enlightenment was his decision to take scholars along on his expedition: among the other discoveries that resulted, the Rosetta Stone was found. He was defeated by Cezzar Ahmet in Syria near the Castle of Saida. Napoléon's fleet in Egypt was completely destroyed by Nelson at The Battle of the Nile, so that Napoléon became land-bound. A coalition against France formed in Europe, the royalists rose again, and Napoléon abandoned his troops and returned to Paris in 1799; in November of that year, a coup d'état made him the ruler and military dictator ("First Consul") of France. According to the French Revolutionary Calendar, the date was 18 Brumaire. Napoléon instituted several lasting reforms in the educational, judicial, financial and administrational system. His set of civil laws, the Napoleonic Code or Civil Code, has importance to this day in many countries. The Code was largely the work of Jean Jacques Régis de Cambacérès, who held the office Second Consul under Bonaparte from 1799 to 1804. In 1800, Napoléon attacked and defeated Austria again; afterwards, the British also signed a peace treaty. After Napoléon had enlarged his influence to Switzerland and Germany, a dispute over Malta provided the pretext for Britain to declare war on France in 1803 and support French royalists who opposed Napoléon. Napoléon, however, crowned himself Emperor on 2 December 1804 (illustration, right). Claims that he seized the crown out of the hands of Pope Pius VII during the ceremony in order to avoid subjecting himself to the authority of the pontiff are apocryphal; after the Imperial regalia had been blessed by the Pope, Napoléon crowned himself before crowning his wife Joséphine as Empress. Then at Milan's cathedral on 26 May 1805, Napoléon was crowned King of Italy, with the Iron Crown of Lombardy. By 1805 the Third Coalition against Napoléon had formed in Europe; Napoléon attacked and secured a major victory against Austria and Russia at Austerlitz (2 December 1805) and, in the following year, humbled Prussia at the Battle of Jena-Auerstedt (14 October 1806). As a result, Napoléon became the de facto ruler over most of Germany. Napoléon marched on through Poland and then signed a treaty with the Russian tsar Alexander I, dividing Europe between the two powers. In the French part of Poland, he established the restored Polish state of Grand Duchy de Varsovie with the Saxonian King as a ruler. Then on 17 May 1809 Napoléon ordered the annexation of the Papal States to the French empire. Napoléon attempted to enforce a Europe-wide commercial boycott of Britain called the "Continental System". He invaded Spain and installed his brother Joseph Bonaparte as king there. The Spanish rose in revolt, which Napoléon was unable to suppress. The British invaded Spain through Portugal in 1808 and, with the aid of the Spanish nationalists, slowly drove out the French. While France was engaged in Spain, Austria attacked in Germany, but after initial success suffered defeat at the Battle of Wagram (6 July 1809). Alexander I of Russia had become distrustful of Napoléon and refused to co-operate with him against the British. In 1812, Napoléon invaded Russia. Napoléon ignored the advice of the Poles, who predicted long-term war rather than a quick victorious campaign. They proposed to retrieve former Polish areas from Russian hands gradually and build a base for further war there. As the Poles predicted, the Russians under Kutuzov, who declared a Patriotic War, retreated instead of giving battle. Outside Moscow on 12 September, the Battle of Borodino took place. The Russians retreated and Napoléon was able to enter Moscow, assuming that Alexander I would negotiate peace. Moscow began to burn and within the month, fearing loss of control in France, Napoléon left Moscow. The French Grand Army suffered greatly in the course of a ruinous retreat; the Army had begun as over 600,000 men, but in the end fewer than 10,000 crossed the Berezina River (November 1812) to escape. Encouraged by this dramatic reversal, several nations again took up arms against France. The decisive defeat of the French came at the Battle of Leipzig, also called "The Battle of the Nations" (16-19 October 1813). In 1814 Britain, Russia, Prussia and Austria formed an alliance against Napoléon. Although the defence of France included many battles which the French won, the pressure became overwhelming. Paris was occupied on 31 March 1814. The marshals asked Napoléon to abdicate, and he did so on 6 April in favour of his son. The Allies, however, demanded unconditional surrender and Napoléon abdicated again, unconditionally, on 11 April. In the Treaty of Fontainebleau the victors exiled the Corsican to Elba, a small island in the Mediterranean 20 km off the coast of Italy. They let him keep the title of "Emperor" but restricted his empire to that tiny island. Napoléon tried to poison himself and failed; on the voyage to Elba he was almost assassinated. In France, the royalists had taken over and restored King Louis XVIII to power. On Elba, Napoléon became concerned about his wife and, more especially, his son, in the hands of the Austrians. The French government refused to pay his allowance and he heard rumours that he was about to be banished to a remote island in the Atlantic. Napoléon escaped from Elba on 26 February 1815 and returned to the mainland on 1 March 1815. The French armies sent to stop him received him instead as leader. He arrived in Paris on 20 March with a regular army of 140,000 and a volunteer force of around 200,000 and governed for a Hundred Days. Napoléon's final defeat came at the hands of Arthur Wellesley, 1st Duke of Wellington and Gebhard Leberecht von Blücher at the Battle of Waterloo in present-day Belgium on 18 June 1815. Off the port of Rochefort, Napoléon made his formal surrender while on board the HMS Bellerophon on 15 July 1815. Napoléon's exile to Elba is the inspiration for the famous palindrome: "Able was I ere I saw Elba." Napoléon was imprisoned and then exiled by the British to the island of Saint Helena (2,800 km off the Bight of Guinea) from 15 October 1815. There, with a small cadre of followers, he dictated his memoirs and criticized his captors. In the last half of April 1821, he wrote out his own will and several codicils (a total of 40-odd pages). When he died, on 5 May 1821, his last words were: "France, the Army, Joséphine." In 1955 the diaries of Louis Marchand, Napoléon's valet, appeared in print. He describes Napoléon in the months leading up to his death, and led many, most notably Sten Forshufvud and Ben Weider, to conclude that he had been killed by arsenic poisoning. Arsenic was at the time sometimes used as a poison undetectable when administered over a long period of time. In 2001 Pascal Kintz, of the Strasbourg Forensic Institute in France, added credence to this claim with a study of arsenic levels found in a lock of Napoléon's hair preserved after his death: they were seven to thirty-eight times higher than normal. Cutting up hairs into short segments and analysing each segment individually provides a histogram of arsenic concentration in the body. This analysis on hair from Napoléon suggests that large but non-lethal doses were absorbed at random intervals. The arsenic severely weakened Napoléon and remained in his system. There, it could have reacted with calomel- and mercury-based compounds -- common medicines at the time -- and thus been the immediate cause of his death. More recent analysis on behalf of the magazine Science et Vie showed that similar concentrations of arsenic can be found in Napoléon's hair in samples taken from 1805, 1814 and 1821. 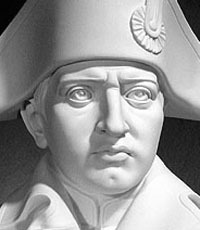 The lead investigator, Ivan Ricordel (head of toxicology for the Paris Police), stated that if arsenic had been the cause, Napoléon would have died years earlier. Arsenic was also used in some wallpaper, as a green pigment, and even in some patent medicines, and the group suggested that the most likely source in this case was a hair tonic. Prior to the discovery of antibiotics, arsenic was also a widely used, but ineffective, treatment for syphilis. (This has led to speculation that Napoléon might have suffered from syphilis.) Controversy remains as the Science et Vie analysis has not addressed all points of the arsenic poisoning theory. Napoléon was twice married, first to Joséphine de Beauharnais (whom he crowned as Empress Joséphine, and by whom he had no heirs, leading to a divorce) and second to Archduchess Marie Louise of Austria, who became his second empress. 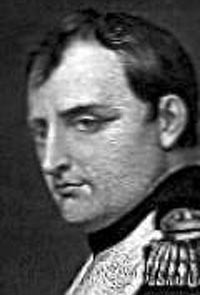 He had one child by Marie-Louise: Napoléon Francis Joseph Charles Bonaparte (1812-1833), King of Rome (known as Napoléon II of France although he never ruled). Napoléon also had at least two illegitimate children: Charles, Count Léon, (1806 - 1881) (son of Louise Catherine Eléonore Denuelle de la Plaigne 1787 - 1868) and Alexandre Joseph Colonna, Count Walewski, (1810 - 1868) (son of Maria, Countess Walewski 1789 - 1817), who both had descendants. Other information points to Napoléons's having had further illegitimate children: Émilie Louise Marie Françoise Joséphine Pellapra, (daughter of Françoise-Marie LeRoy), Karl Eugin von Mühlfeld (son of Victoria Kraus), and Barthélemy St Hilaire (unknown). Also Hélène Napoleone Bonaparte (daughter of Countess Montholon). Napoléon had asked in his will to be buried on the banks of the Seine, but when he died in 1821 he was buried on Saint Helena. This final wish was not executed until 1840, when his remains were taken to France and entombed in Les Invalides, Paris. A national plebiscite approves the new French constitution, but so many voters sustain that the results are suspect. Napoleon takes charge. imposes a new constitution on Holland. is proclaimed "Consul for Life" by the French Senate after a plebiscite from the French people. crushes the Prussian army at Jena, Germany. 's army defeats the Russians at the Battle of Smolensk during the Russian retreat to Moscow. On the road to Moscow, Napoleon wins a costly victory over the Russians at Borodino. The Allies defeat Napoleon at the Battle of Dresden. 1. disembarks at Portoferraio on the island of Elba in the Mediterranean. Napoleon arrived at Saint Helena for the beginning of his exile. King Louis Napoleon of France survives an assassination attempt by Giuseppe Maria Fleschi, who had rigged 25 guns together and fired them all with the pull of a single trigger. Napoleon III captured at Sedan. Napoleon III capitulates to the Prussians at Sedan, France.